New research(1) from Global Jet Capital, a provider of financing solutions for large-cabin, long-range private jets, reveals that 709 mid to heavy private jets were delivered to Europe between 2011 and 2015, with a combined value estimated at over $35.4 billion. While overall deliveries of business jets to Europe are down 35%, when comparing the five-year time periods 2006-2010 with 2011-2015, deliveries of mid to heavy jets have increased by 18%. 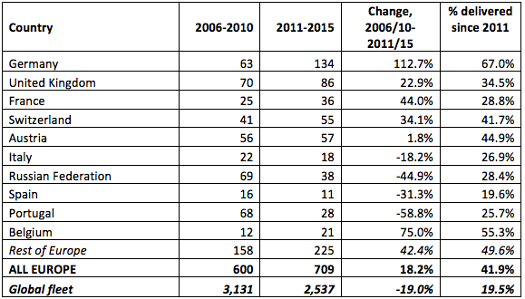 Similarly, the corresponding figure for global deliveries of larger jets has also decreased by 19%. The largest number of deliveries was to Germany (134), accounting for one in five of all mid-sized to heavy jet deliveries to Europe between 2011 and 2015. This is an increase of 113% when compared to the previous five-year period (2006-2010). The second largest number of deliveries was to the UK (86 deliveries), followed by Austria (57 deliveries) and Switzerland (55 deliveries). The aviation finance specialist, which recently completed the purchase of the aircraft lease and loan portfolio of GE Capital Corporate Aircraft in the Americas representing approximately $2.5 billion of net assets, has around $1 billion to lend to clients to purchase relevant business aircraft in Europe and elsewhere around the world. Dave Labrozzi, Chief Operating Officer of Global Jet Capital said: “Long term, we expect attractive growth in the European business aviation market. Despite deliveries to the region being down as a whole, it has experienced a steady increase in the number of larger aircraft being delivered.